Note to readers: The downtown Dallas edition of The Palm restaurant is closing on Friday, June 30th after a 33-year run dating to May 1984. Your friendly content provider didn’t get there very often because, well, the prices. 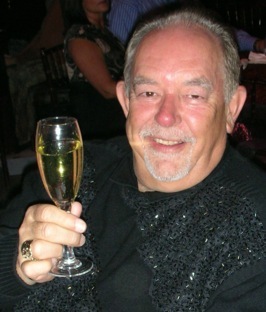 But just over a year after The Palm opened, I had a still unforgettable lunch interview with Robin Leach, who was perfectly comfy with the high-cost menu. 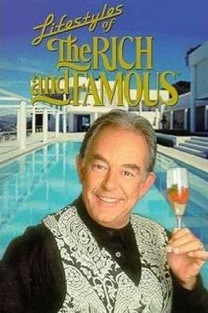 He was in the heyday of his signature show, Lifestyles of the Rich and Famous, which ended up enduring until 1995. Leach proved to be a delicious fount of gossip and pointed quotes, which is the way I’ll always remember The Palm. This article was first published on July 17, 1985. You’d need a butcher knife to cut through the goo. “It was good to see ‘Lizer’ again,” he says, speaking of “old friend” Liza Minnelli. You’d need a hacksaw to cut through the glop. “She’s the star who gave it all up for love -- and is now right back in the swim of things!” This time Leach is talking about Esther Williams. You’d need a bloody chain saw to cut through the effervescence flowing through each and every edition of Lifestyles of the Rich and Famous. Leach nods agreeably from a table at The Palm restaurant, where the walls are thick with drawings of national and local celebrities. He has the shape of a Gummi Bear and a nose for gum-drop gossip. Sure, The Love Boat is hard-edged drama compared to Lifestyles. Some of the rich and famous at first were reluctant to let the former tabloid reporter show America their boardrooms, bedrooms and bathrooms. During the first four months of the show, which premiered in March 1984, Leach says, he called on a lot of “semi-friends” to help get things rolling. Now Lifestyles is in 165 media markets. Stars are standing in line to be petted. “Some of them thought it was going to be an expose of the wealth and waste and the conspicuous consumption,” he says, “and that it would come complete with editorial comment condemning this horrendous misuse of money. But we didn’t. Nobody appointed me judge or jury. Well, sort of. Dallas native Morgan Fairchild trusted Leach to the point where she willingly got into a bathtub for him while his cameras recorded the moment for Lifestyles. Sensational? Yes, says Robin. Scandalous? No. It was all in good taste, after all, and viewers didn’t see any more of Morgan than they could by watching her between the sheets in a prime-time potboiler. But the very idea of Morgan taking a bath while Leach bubbled -- why, it’s . . . sensational! Years ago, while interviewing actress Susan Anspach, he learned from her that she had two “illegitimate” children, one by actor Jack Nicholson. Leach says he “broke” the story, but in a nice way. A native of Harrow, England, Leach was weaned on British tabloid journalism before coming to the States, at the age of 21, in November 1963. His first job, during the Christmas rush season, was in the shoe department of a New York department store. He worked six months as a reporter for the New York Daily News before quitting to freelance for a variety of publications, including the National Enquirer and Star tabloids. His first experience in television was frequent guest shots on The Mike Douglas Show. He became a regular on Vidal Sassoon’s short-lived Your New Day program, reported Hollywood news for New York- and Los Angeles-based morning talk shows and worked with CNN for 18 months on a show called People Tonight. His self-described “bizarre voice of mine” went nationwide on Entertainment Tonight, on which Leach seemingly attended every New York party and then gushed about it. He left E.T. in August 1983 to get Lifestyles in shape for production by his own Leach Entertainment Features. He also produces Steve Allen’s The Start of Something Big, which premiered in April and is carried here at 5 p.m. Sundays on Channel 11. There is a message, Leach contends, behind the swimming pools, movie stars and other gilt trips presented weekly on Lifestyles. The message was spelled out in a recent “Rags to Riches” segment about millionaire developer Ken Behring. “Dedication pays big dividends,” Leach said after Behring had showed off his mansions, his antique cars and his personal wine taster. America must fight, he says, for truth, justice and the filthy rich. Leach’s lot in life, then, is to traipse through Antigua and other assorted play lands and palaces. “Silk pajama journalism,” as he calls it, can be found almost anywhere a star is living the life expected of him or her. There are holdouts, though. Meryl Streep, Robert De Niro, Al Pacino -- they’ll never let Robin magnify their lives. Robin doesn’t care, either. “They’re boring,” he says. “First of all, these people don’t talk, which is very important. Those people mumble. Those kinds of people can’t express themselves. They can’t put sentences together. They can’t deliver good conversation unless they’re memorizing the lines written in somebody else’s script. Leach say he has had only one uncomfortable scene with a star in 25 years of covering show business. In this case it was a star made by Leach, whose “world exclusive” interview with Margaret Trudeau was an international sensation. Leach’s story, which he says he censored, nonetheless included “fairly lengthy anecdotes about the night she slept with 21 men.” Four months after the interview was published in People, The Star and other magazines, Leach and Trudeau met again at New York’s Studio 54 disco.